The amazing thing about these cards is that you can do whatever you want, and for whomever you want. These are also perfect for your kids, parents, or even work colleagues. For example, your child can scratch his birthday present, the place you will go on your next family trip, or even the dinner for Saturday`s family dinner. For your boyfriends/hubby, you have so many possibilities. You can make a card including the place of your next dinner, or the city you`re going to visit in the next weekend. The possibilities are endless. My tips for the above "ingredients". Make sure that you don`t buy the cheapest acrylic paint. It has to be quality acrylic paint so it will cover your writing. The paper should be of a high quality too. I recommend using the ones that are meant for business cards. It has to be a little shiny, otherwise, you won`t be able to scrap the card. As you can see in the picture, I tried on 2 different types of paper. The blue one wasn`t shiny, but the grey one was. I had a hard time trying to scratch the blue card, but with the grey one, it was easy. What you have to do first is to decide about how big or small you want your cards to be. You can make them simple, you can make them big, small, or in any shape you want. Once you decided, cut the cartons into the desired shape. Make sure that you cut with 1 or 2 pieces more. You can always make a mistake, so it`s better if you have a new card on your hand. And now you can start writing what you want. Use a bowl to combine the paint with the dish soap. You can also use a plastic cup (that`s what was handy for me). Put one part dish soap and two parts acrylic paint. I can`t tell you exactly the quantities because this depends on how many cards you want to make with a specific color. But you will figure that out once you start filling in the cards. The formula is the same, regardless the quantity you want to make. - don`t be impatient about the drying part. It took my cards to dry a whole night. So make sure that you allow them enough time to dry. When you want to change the colors, make sure that you wash very well the brush and the cup you are using. And before using another color, wipe them with a hand towel. You can put glitter if you want. At first, I was in doubt whether I will use it or not. But finally, I liked it so much that I used it on all the cards. You have to put the glitter right after you put the paint on the cards. If you want your writing to be in a specific shape, just use a coin, or the bottom of a cup or whatever you want, and draw a thick line using a crayon. In this way, you will be able to color the shape that you want. Don`t be surprised if you have problems with one of your colors. I had problems with the red. I have no idea why, but when I used red my writing was visible. I gave it another try, using more acrylic paint, but the writing was still visible. I just gave up and used other colors. My cards weren`t perfect. I was short on time, so I was in a hurry. But my boyfriend was really surprised and he loved them. The most important thing was that they were handmade, and I did them for him. What a fun idea, and what a thoughtful gift! Gifts from the heart are always the best. Thank you so much for sharing this lovely post at the Hearth and Soul Link Party. Have a lovely weekend! That's really cool. It was a sweet gift you made there, but I see endless possibilities for this idea. Thank you for sharing at The Really Crafty link Party this week. Pinned! and definitely will come back from now on. I want to encourage yourself to continue your great work, have a nice afternoon! My adult children and their spouses grumble because they have money but do not have money to waste on scratch offs so this would be a great funny joke as a gag gift or a fun thing for my grandchildren to scratch like to see if they are allowed to spend the week-end or where their gifts are. These are some great ideas! Love them! Cute idea for a card - Something different that normal! That looks like such a fun idea! It always means so much more when its from the heart, or it does to me anyway. Great Idea. What a lovely and creative idea, I bet he really enjoyed it and of course it is extra special because you put all your love into it! This is such a creative idea. I think it could be a fun, step by step thing. Like a treasure hunt! What a sweet, thoughtful and sentimental idea! I bet he was grinning ear to ear. These would be so fun for a children's birthday party too. This is such a great idea. So great to know for gifts or surprises. That's so much fun! I've never made my own scratch cards before and I think it's a brilliant idea! You can customize it and design it! Oh how clever! My MIL loves to make her own cards and I bet she'd find this really fun to try. These are great ideas!!!!! Ought to try them out soon enough. What a fun idea for a gift! I bet my boys would love something like this when they are a bit older (and can read). Or, it could be something fun we make together for my husband this year. Wow! 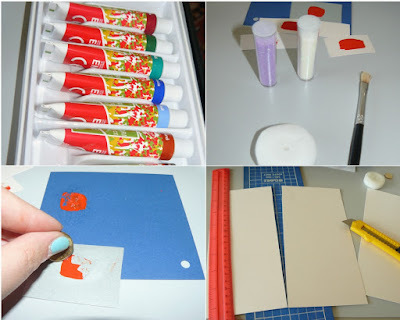 I love the idea of DIY scratch cards looks creative ad fun. oh my gosh, what a brilliant idea! It never crossed my mind that we can diy those! This will be my weekend project i will be making cards for everyone I know! I love DIY gift ideas! They are so handy and so beautiful! I love making them. What a fab idea! I love getting homemade gifts - you can tell that a lot of effort has gone into them! This is such a cool idea and a really thoughtful gift! They'd be great at events too like scratch cards to win prizes! This is such a creative post. I will save this post to share with my daughter. What a cute idea for a card! I love anything homemade - it's so much more personal. Will definitely be trying this!